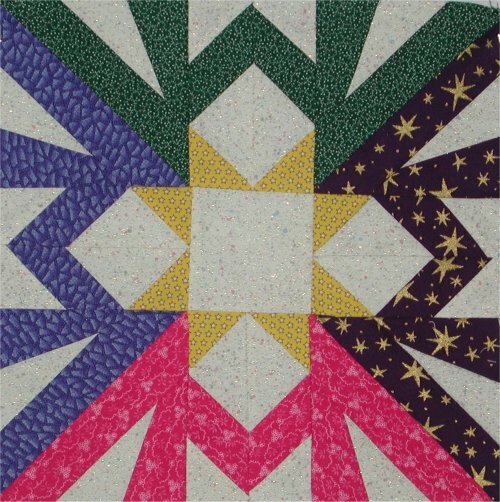 Over the past several months, I have been pleased to be one of people to test sew quilt blocks designed by Marcia Hohn of Quilter's Cache before she puts them up for the public to use. The block that I was testing was named "West Virginny Moonshine". As I was working on it, it occured to me that this block might work up nicely as a scrap quilt. Why this random thought occured to me is a mystery, as I sure don't need any more new projects. Furthermore, why I actually decided to ACT upon this random thought is, indeed, the $64,000 question. I chalk it up to sheer lunacy. I had quite a bit of this very nice soft white background, which also had splatters of blue, green, purple and glitter on it. It turned out to be a perfect choice. Unfortunately, I didn't have *all* that I needed, so I ended up buying 2 more yards of a compatible splattered white fabric for the last two blocks plus the borders. One weekend during the construction of the top, I went to a quilt show in a city nearby. 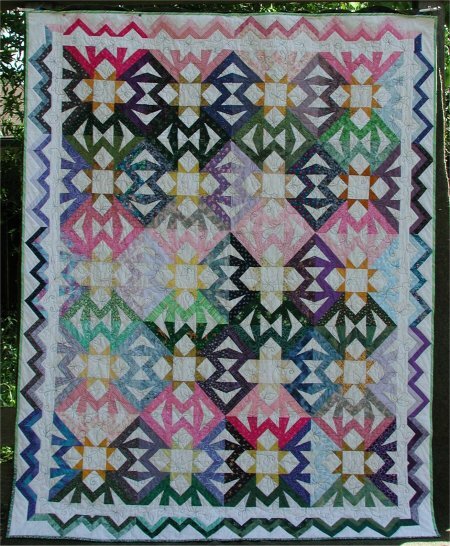 One book I bought was on making pieced borders, "Foundation Borders" by Jane Hall and Dixie Haywood. The premise of this book was interesting ... the author contends that most quilts have plain fabric borders simply because they are the easiest borders to slap on a quilt. 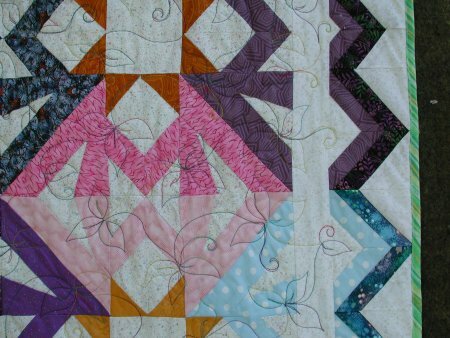 With just a little bit of thought and a little bit more effort, a much more interesting pieced border could be made. With just a small alteration, I used one of the border patterns in the book.